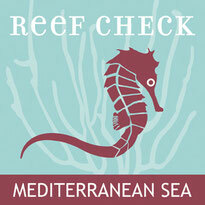 Sponges die-off in the Adriatic sea - Welcome on Reef Check Mediterranean Sea! In the last years scuba diving became an indispensable tool for marine biologists not only for the possibility to collect samples but also to directly observe the organisms in their natural environment. 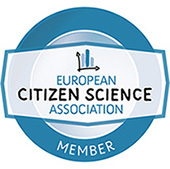 Moreover, long-term monitoring allow to study their life cycle and sometimes to attend to unexpected events, such as mass mortality cases of one or more species. Several factors, for example the global warming, the use of pollutants, the over-harvest of commercial species and the introduction of alien species, may promote disease outbreaks in marine animals. 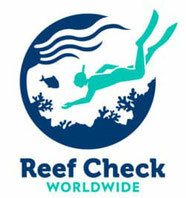 Over the last decades, numerous records of marine animals suffered from pathologies were reported, some of which caused events of mass mortality, such us the disease that hit a sea urchin in the Caribbean o that described for the red coral or several gorgonian species from the Mediterranean. Factors triggering the pathology are not always clear, the changing of some environmental parameters (for example the temperature increase) often makes the animal more vulnerable to infections. Even the sponges, in spite of their ability to renew the damaged portions, may be hit from diseases. In 1986 in the Mediterranean an important mass mortality event occurred and involved commercial sponges. The disease was probably due to a bacterium able to deteriorate the spongine fibres.This is not the only case, in fact during the last years there were many records of sponge diseases in the Italian seas, such as that in 1994 in Apulia (Ionian Sea) or that of the sponges from the Elba Island (Tyrrhenian Sea) in 2008. During August 2009 a mortality event of three horny sponge species (Sarcotragus spinosulus, Ircinia variabilis and Spongia officinalis) occurred in the northern Adriatic sea, exactly at the Conero Promontory (Ancona). In this area, the sponges settle on the towards North side of the “Scoglio del Trave” and represent one of the main communities on this rocky substrate from 4,5 to 7m depth. 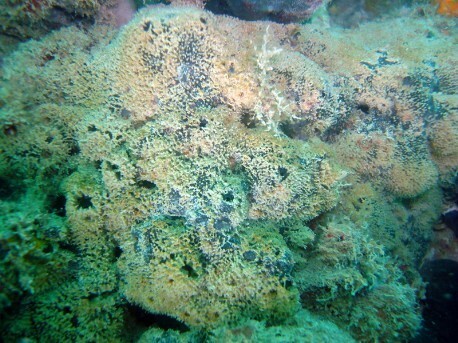 The diseased specimens looked different from those in healthy conditions, some showed small necrotic light areas on the surface, others were breaking down with a decayed surface; the sponges were often covered by bacteria forming wide whitish areas. In the next disease step, the sponge tissues resulted partially or completed deteriorated and it was possible to see the dense woof of spongine fibres the sponge skeleton is made of. At the end of August, the density of the diseased specimens varied from 1 to 4 per m and the next month most of the dying or dead sponges resulted detached from the substrate because of rough sea. The causes of the phenomenon are unclear, but the high sea temperature surely played a key role in triggering the disease. The Conero Promontory is characterised by a low bottom not exceeding 14 m depth and the sea temperature rapidly increases during the warm season. The summer of 2009 was the most hot of the last three years and at the end of August the superficial sea temperature reached 27,7 °C. This could caused the development of a pathogen o damaged any defensive mechanism of the sponges, promoting the disease outbreak. Most of the Trave’s sponges is still in good health, now the sea temperature start going down and probably the disease is regressing. However, cases of sponge disease seem to be more and more frequent both in the Mediterranean and in tropical environments and the studies carried out to understand causes and prevent consequences are very few. Sponges hold an important ecological role for their ability to filter large amounts of waters and because they offer refuge to numerous commensal species, therefore the disappearance of a sponge population could have unpredictable consequences both on the habitat and on the associated species. Moreover, the evident correlation with environmental changes is a further motivating force to study the phenomenon. Sponges are simple animals that present an irregular shape and their colors are due to pigments or symbionts. 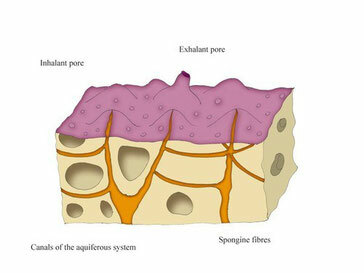 The surface is scattered with pores while the inner part shows a dense canal web forming the aquiferous system; the sea water comes in the sponge through the inhalant pores, it goes through the aquiferous system and comes out by exhalant pores. The water movement is promoted by the flagellum beating of special cells called coanocytes. During the water passage, the sponge withhold oxygen and food and this kind of feeding is defined active filtration. Sponges can have a flexible “skeleton” made of collagenous fibres (spongine) or a scaffolding of needle shaped structures, called spicules. Some species show both spicules and collagenous fibres while others, such us the horny sponges, are only made of spongine. The horny sponges also include bath sponges, known for their softness and elasticity.